General Electric C.E.O. 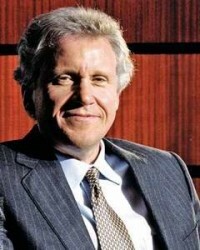 Jeffery Immelt was born in Cincinnati, Ohio in 1956. With GE since 1982, Immelt holds a B.A. in Applied Mathematics from Dartmouth College and an M.B.A from Harvard Business School. In addition to the C.E.O. post, Immelt is on the board of two non-profit organizations, including the Robin Hood Foundation, which attempts to alleviate poverty in New York City. As GE’s chief executive, Immelt gives the impression that he's at home at a turbine factory in Schenectady, N.Y., a research lab in Bangalore, and a dress rehearsal for Saturday Night Live. "This is not a man in a bubble," NBC's Conan O'Brien told Time magazine. Immelt differs from his predecessor, Jack Welch, who ran GE with a mixture of charisma and cost-cutting aggression that helped drive the company's earnings and increase its imposing stature on Wall Street. When Immelt replaced him in 2001, the then 45-year-old set about creating a quiet revolution at the company. "The GE shaped by a mathematics graduate, top salesman and C.E.O. is a humbler, though no less effective, company than in Mr. Welch's bombastic days," declared the Financial Times. General Electric, the world's second largest company based on market value, derives half of its $150 billion revenues from outside the country, and Immelt is an easy target for anti-globalization proponents. Nevertheless, Immelt maintains that the United States, where GE employs 160,000 of its 316,000 employees, remains the ideal place to manufacture complex equipment such as the jet engine turbines once built by his father, who also worked GE's aircraft engine division for nearly 40 years. Immelt believes the decline of the U.S. manufacturing base could be slowed down if America produced more engineers to plug a widening skills gap with emerging giants such as China and India. "I'm out talking about this company seven days a week, 24 hours a day, with nothing to hide,” Immelt states on GE’s Web site. “We're a 130-year-old company that has great record of high-quality leadership and a culture of integrity."